There are millions of smartphone and tablet users out there, and their numbers just keep growing. Studies predict that by December 2014, about 25% of global internet traffic will be from mobile. Content has always played a huge role in marketing and website promotion, and with so many people constantly consuming content through their mobile devices, marketers need to adopt a mobile-first approach to content creation and publication. 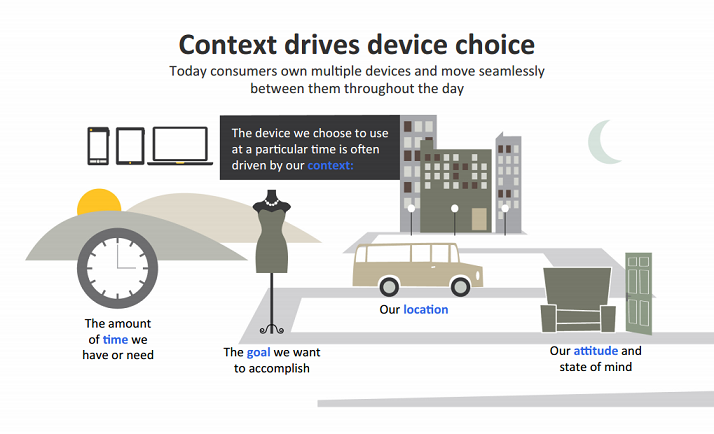 In 2012, Google conducted a study on cross-platform consumer behavior, which discussed why and how people use different devices throughout the day. Many of the points presented in this study are still applicable today, and I think one of the most important lessons we can learn from it is about context. Based on Google’s presentation, the four major factors that define a user’s context are the amount of time they have or need, the goal they want to accomplish (or “user intent”), their location, and their attitude or state of mind. Studying and understanding these four factors are crucial in developing an effective content strategy. Many other marketers focus solely on user intent, but that’s not enough when dealing with mobile users. Considering all four factors allows you to determine what your mobile audience is looking for, and how to serve the right content in the right format and at the right moment. Mobile users have high expectations when it comes to content loading speed, especially when they’re on the go or in a hurry to get some important information. Google Developer Advocate Ilya Grigorik said that 85% of mobile users expect websites to load as fast (or even faster) than on desktop devices. While loading speed may be more of a technical issue, this statistic can tell you a lot about how you should create content for your impatient mobile audience. Your content needs to be formatted, organized, and presented in a way that allows users to read and navigate in the least amount of time. User Intent is one of the most important factors to look into when developing any content or SEO strategy. What does your audience want to accomplish using their mobile devices? Do they want to compare prices or buy a product? Do they want to entertain others or distract themselves? Understanding your audience’s intent helps you develop more relevant and engaging content. 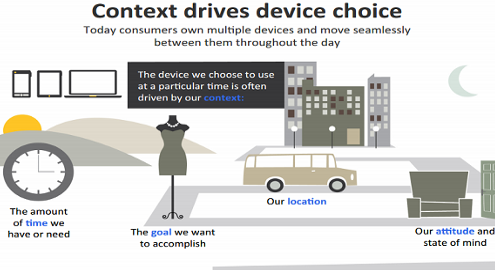 Studies show that 40% of mobile search is done with local intent. Creating localized content based on your audience’s geographic location can help improve your brand’s visibility and discoverability, but location for mobile user context can sometimes go beyond general geographic areas. Many mobile users use their devices to research about products even while inside a physical store, and this “showrooming” or “pre-shopping” behavior is expected to be a major trend this year. Your audience’s attitude or state of mind can affect how they interact with your brand’s website or content. People who are ready to buy will often go straight to checkout, while those who are still considering it will look for price lists and product comparisons. Tailoring your content to your audience’s mindset will encourage them to take action, whether you’re trying to convert a sale or acquire a new lead. Getting to know your audience and understanding their context has always been the best way to create relevant and effective content. Talk to us to see how our own Content team develops great content for our clients.